Many organizations lack an effective strategic management control system that allow them to achieve their strategic and operational goals. This article presents a complete strategic management system that enables managers and executives to manage strategy formulation and implementation in an integrated way. Organizations need to continually adapt themselves to the current turbulent environment in order to be successful. This requires a continuous adaption of the strategy, structure and processes of the organization. However, survey after survey reveal that most strategic change initiatives fail. Many organizations have a fundamental disconnect between the formulation of their strategy and the execution of that strategy into useful action. An important reason for this that many organizations lack an effective strategic management system with which they can realize their strategic and operational objectives. The strategic management system allows managers and executives to control their organizations by managing strategic planning and execution in an integrated way. This article presents the five phases of the strategic management system that helps managers analyze, develop, translate, implement and monitor and adapt their strategies. More than 90 percent of organizations do not succeed in executing their strategies successfully (Kaplan & Norton, 2000). Many organizations have a fundamental disconnect between the formulation and the execution of their strategy. Often an effective strategic management system is absent that allows managers and executives to manage strategic planning and execution in an integrated way. Organizations often do not succeed in translating their strategies into operational objectives, processes and activities. Strategy formulation and implementation are often treated separately instead of as an integrated system. As a result, most strategies fail in the execution phase. The implementation of a strategic management system allows managers and executive to align strategy formulation and implementation. This way, organizations can successfully develop and implement their strategies. Strategic success requires an appropriate strategy but also requires that the strategy is implemented successfully (Hussey, 1996), and timely. A strategic management system consists of a planning and control cycle that enables organizations to achieve its strategy and objectives (see Figure). Planning refers strategic planning and thus to the formulation of the strategy, the translation of that strategy into strategic objectives, the development of an implementation plan with operational objectives, processes, and activities. Control refers to strategy execution, the monitoring of the progress of the execution and when required, the adjustment of the strategy or its execution. The strategic management system is a cycle that integrates the planning and execution of a strategy and consists of five stages: analyzing the external environment, the internal organization and current strategy; developing the mission, vision and strategy; translating the strategy into strategic initiatives, operational objectives, processes and activities; implementing the strategy and finally monitoring and adapting the strategy and its execution. The strategic management cycle begins with a strategic analysis of the external environment, the internal organization and the current strategy of the organization. First, an external analysis is made of the macro-economic environment. This is done by assessing the macroeconomic environment of the organization. This often involves analyzing the political, economic, social, technological, environmental and legal factors and how they can influence the activities and performance of the organization. Next, the industry and market in which the organization operates is analyzed. This can be done by using Michael Porter’s five forces framework. This framework can be used to analyze and industry by look at the five forces that shape strategy: threat of new entrants, bargaining power of buyers, bargaining power of suppliers, threat of substitute products of services and rivalry among existing competitors. This analysis helps to assess the attractiveness of the industry and to identify the forces that may shape the industry. Lastly, an analysis is made of the competition. A competitor analysis obtains information about key competitors that enables an organization to predict the behavior of competitors allowing better strategic decisions. A profile is made of each key competitor based on their product or service offerings, pricing and costs, strategy, strengths and weaknesses, profitability, marketing strategy and market share. In the case of public or non-profit organizations, comparable organizations are benchmarked. Secondly, an internal analysis is made of the organization structure and culture, primary processes and the overall performance of the organization. After this a SWOT analysis is made in which the threats and opportunities that emerged from the external analysis are related to the strengths and weaknesses of the internal analysis. Here the aim is to come up with a strategy that uses the internal strengths of the organization to play into external opportunities and mitigates internal weaknesses and external threats. Lastly, a strategy analysis is made of the performance of the current strategy of the organization. Strategy development starts with the formulation of the mission and strategic vision of the organization. The mission describes the reason of existence and identity the organization and more specifically the customer needs the organizations aims to meet. The strategic vision describes the goals and desired middle to long-term future state of the organization. The strategic vision helps clarify the direction in which an organization is to move (Kotter, 1995). The strategic vision needs to be clearly defined and well formulated (Hussey, 1996). In addition, the strategic vision needs to be attractive and easy to communicate toward organizational members, customers, shareholders, and other relevant stakeholders. An attractive and ambitious strategic vision can help to attract and unite organizational members and stimulate them to increase their effort (Trice & Beyer, 1991). After formulating the strategic vision, top management needs to develop a strategy that is able to achieve it. A strategy describes the combination of the (long-term) goals for which an organization is striving and the means by which it is seeking to achieve these goals (Porter, 1980). A strategy serves as a roadmap to get where a company wants to go. Based on Porter’s work, Treacy and Wiersema (1997) argue that organizations must choose one of the following three generic strategies: operational excellence, customer intimacy and product leadership. The operational excellence strategy is about the production and delivery of products and services. The objective is to lead the industry in terms of price and convenience. The Customer intimacy strategy is based on delivering what specific customers want. The objective is long-term customer loyalty and customer profitability. A product leadership strategy is based on delivering the best products of services. It is about on producing a continuous stream of state-of-the-art products and services. The objective is the quick commercialization of new ideas. Each strategy requires a different primary process, organization structure, organization culture and competences of organizational members. A successful strategy is a system with seven integrated aspects: the goals of the organization, the strategy to achieve those goals, the primary process, structure, culture and people that can deliver the strategy, a planning and a control system that monitors the achievement of the strategy and finally the people who are able to execute the strategy. This is the Strategy System (see Figure). • What products or services are offered by the organization? • What customer needs are fulfilled by the organization? • Who are the customers or customer groups (segmentation) that are served by the organization? • With what key processes (primary process) does the organization distinguish itself from competitors in the eyes of customers? • What organization structure, culture, and human resources are needed to implement the strategy? The task of top management is to choose and work out a strategy that fits the current organization most and allows the organization to achieve it strategic vision and goals. During the strategy development process it is important to involve middle managers and key lower level employees in decision-making about the strategy and its execution. Research demonstrates that involving employees has many advantages: better quality of decisions, better understanding of the strategy, better organizational learning, higher commitment to the strategy and organization, higher job satisfaction, less resistance to change and better adaptability of the strategy. More practical, a strategy is a system with seven integrated aspects: the goals of the organization, the strategy to achieve those goals, the primary process, structure, culture and people that can deliver the strategy, a planning and a control system that monitors the achievement of the strategy and finally organizational members who are able to execute the strategy (see Figure). The outcome of the strategy development process is a strategic plan that describes the long-term goals of the organization and way in which it aims to achieve these goals. The strategic plan contains the goals; strategic initiatives, primary process, organization structure, culture and human resources that are needed to achieve the strategic goals. After the strategy is developed it needs to be translated into objectives that can be clearly communicated to organizational members. Even the best strategy is worthless when managers cannot translate the strategy into operational reality. 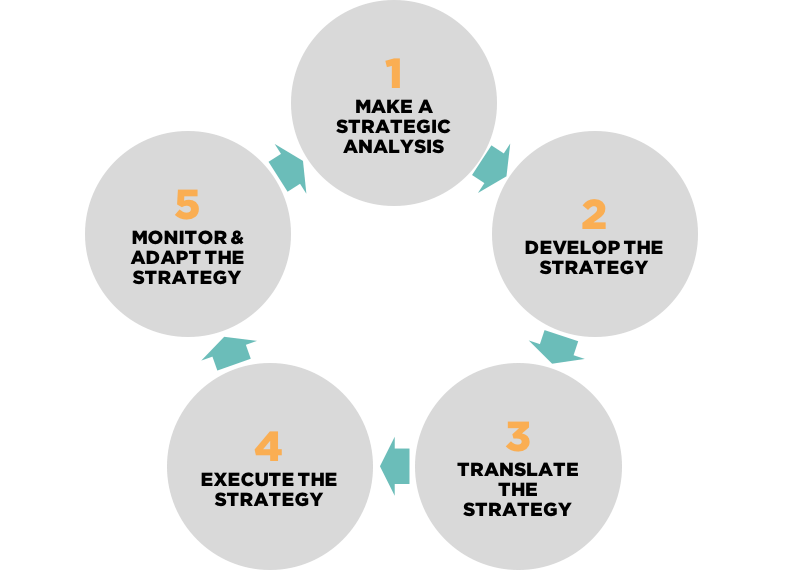 The strategy implementation plan specifies the processes, activities and operational objectives that are required to achieve the goals of the strategy. The strategic objectives need to be translated into measurable operational implementation sub-objectives (Reid, 1989) and linked to departmental and individual goals (Kaplan, 1995). In addition, progress measurement points or ‘milestones’ need to be established (Owen, 1982). Measurable objectives provide an effective basis for management control of the implementation (ibid). Without concrete objectives and milestones, it is impossible to measure the progress of the strategy implementation. This makes managing and improving the strategy implementation impossible. Therefore, the implementation plan needs to contain clear and measurable objectives or targets. Clear and specific tasks need to be defined which are required to achieve these targets. Everyone with strategy implementation responsibilities needs to know what to do in order to implement the strategy and what concrete objectives they have to attain. Unclear objectives leave room for differential interpretation and discretion and may thus contribute to implementation failure (Barrett, 2004). Next, performance indicators need to be developed for each strategic objective. Without concrete performance indicators it is not possible to measure the progress of the strategy execution and to manage and improve it. These performance indicators are part of management control systems or dashboards that measure the progress of (key) performance indicators. Budgeting is the last part of the strategy translation. Budgeting translates the strategic decisions into its financial consequences. A budget plans future income and spending. A budget is drawn up for each financial year and contains information on the estimated value of sales and value of costs. During the year the actual performance of the organization is measured against the budget. The annual budgeting process is often very elaborate in public organizations where the strategic objectives, performance indicators and budgets. Strategy implementation starts with developing an operational implementation plan. The implementation plan consists of annual plans for every organizational unit and the organization as a whole. The implementation plan contains a forecast of the number of products or services the organization expects to deliver in the next year and the resources that are required to deliver the products or services. The implementation plan describes the processes and activities that are needed to achieve the strategic goals. In addition, the implementation plan also describes the responsibilities for those processes and activities. Implementation can only be successful when there is a clear and shared understanding of who does what, when, at what cost (Allio, 2005). Not only should the necessary actions to implement the strategy be identified and planned, responsibility for these actions should be allocated as well (Owen, 1982). By allocating clear responsibilities for the execution of the implementation activities, progress can be measured and controlled (Reid, 1989). After developing the implementation plan the actual implementation of the strategic initiatives, process improvements and organization structure changes. Research has shown that this is the most difficult stage of the strategic management process as most strategies fail in the implementation phase. Even the best-made strategies are worthless if they cannot be successfully implemented (Schilit, 1987). Monitoring and adapting the strategy is the last phase in the strategic management cycle. This stage consists of monitoring the progress of the realization of the strategic objectives and milestones of the strategic plan. When objectives or milestones are not being met the strategy or its execution must be adapted. In order to make these adjustments it is required to assign clear responsibilities for the achievement of those targets. When objectives are not being met, the person or persons responsible need to be held accountable. As strategy implementation plans are destined to change, implementation teams need to regularly meet in well-structured, punctuated sessions to share information, reconfirm priorities (Allio, 2005) and make decisions. This way, management can make adjustments when needed and thus control the strategy implementation effort. To make these adjustments it is required to assign clear responsibilities for the achievement of those targets. When objectives are not being met, the person or persons responsible need to be held accountable. Many organizations have accountability problems, which may be the result of a lack of planning, the absence of a functional management information system, or the existence of cultural values which do not encourage holding persons, especially in high positions, accountable (Kiggundu, 1996). • In the monthly strategy review meeting the progress of the strategy is discussed on a department level. • In the weekly execution review meeting the progress of the execution of the strategy is discussed on a team level. • In the annual strategy evaluation meeting top management discusses the performance of the strategy is discussed and whether the strategy needs to be adapted or a new strategy needs to be developed. When managers and executives implement the strategic management system within their organizations they have a complete strategy planning and control system that enables them to make a strategic analysis, develop a sound strategy, translate the strategy into clear strategic and operational objectives and activities, monitor the execution of the strategy and adapt the strategy or its execution when needed. This strategic management system allows managers and executives to manage strategy development en implementation in an integrated way, allow them to control their organization. Allio, M.K. (2005) A Short, Practical Guide to Implementing Strategy, Journal of Business Strategy, 26(4): 12-21. Barrett, S.M. (2004) Implementation Studies: Time for a Revival? Personal Reflections on 20 Years of Implementation Studies, Public Administration, 82(2): 249-262. Hussey, D. (ed.) (1996) The Implementation Challenge, Chichester: Wiley & Sons. Kaplan, R.S. & Norton, D.P. (2000) The Strategy Focused Organization, Harvard Business School Press. Kaplan, R.S. & Norton, D.P. (2008) Mastering the Management System, Harvard Business Review, January. Kiggundu, M.N. (1996) Integrating Strategic Management Tasks into Implementing Agencies: From Firefighting to Prevention, World Development, 24(9): 1417-1430. Kotter, J.P. (1995) Leading Change: Why Transformation Efforts Fail, Harvard Business Review, March-April, 59-67. Owen, A. A. (1982) How to Implement Strategy, Management Today, July. Porter, M.A. (1980) Competitive Strategy: Techniques for Analyzing Industries and Competitors, New York: The Free Press. Reid, D.M. (1989) Operationalizing Strategic Planning, Strategic Management Journal, 10(6): 553-567. Schilit, W.K. (1987) An Examination of the Influence of Middle-Level Managers in Formulating and Implementing Strategic Decisions, Journal of Management Studies, 24(3): 271-293. Trice, H.M. and Beyer, J.M. (1991) Cultural Leadership in Organizations, Organization Science, 2(2): 149-169. Treacy, M. and Wiersema, F. (1997) The Discipline of Market Leaders, New Edition, The Perseus Books Group.